Everyone loves a good taco. But like some catfishers on Tinder, taco places often leave you with a haphazard, loosely constructed meal — a meal that forces you to find another restaurant and splurge on a second dinner. After experiencing such trauma many times, I was apprehensive about Deep End, located in Old Fourth Ward, which serves equal parts late night grub and casual cocktails. Much to my relief, Deep End rekindled my love for tacos once again. Unlike some new taco spots, Deep End doesn’t attempt to push unconventional and sometimes offbeat flavors onto hungry patrons. Instead, the menu is focused on simple food that pairs well with a couple drinks. I was eager to try both the tacos and their specialty items. I ordered both a Veggie Taco and a Rolled Ranchero Omelette. My friend ordered the Mahi Mahi Taco along with a Taco Bowl. As I said, I have been burned by bad tacos in the past, so I wanted to be critical, not letting my taco addiction affect my judgement. Both tacos came out pretty quickly along with the taco bowl, but the specialty plate took a bit longer to prepare. The tacos were standard in size. I felt like I’d need at least three, possibly four, if I wanted to be completely sated. But once I saw the omelette, I was glad I had ordered only one taco. I couldn’t finish the monstrous egg mammoth and had to box up the rest to take home. The Veggie Taco had few ingredients (brussel sprouts, potato, onion and lime sauce) but still felt hefty. The sprouts and potato gave the taco its weight, and the tangy, sour flavor of the onion and lime practically made me inhale my plate. After a few large bites that went all too quickly, I had finished my taco. Yet the same size bites barely made a dent in my omelette. The egg was pretty standard, but when combined with the queso blanco, black beans and pico de gallo, it created a smooth and savory harmony. Although the flavors worked well, the omelette itself was quite runny. After I quickly consumed the two flour tortillas accompanying the dish, I felt like I was eating baby food. If I returned again, I’d probably stick to tacos simply because the portions felt easier to manage. My friend agreed that his Mahi Mahi Taco seemed more cohesive than his taco bowl, which felt a little unmixed and wasn’t constructed as artfully as the taco. With a blend of tables, bar seating and booths inside, customers can come to eat, drink or simply hang out for a while. 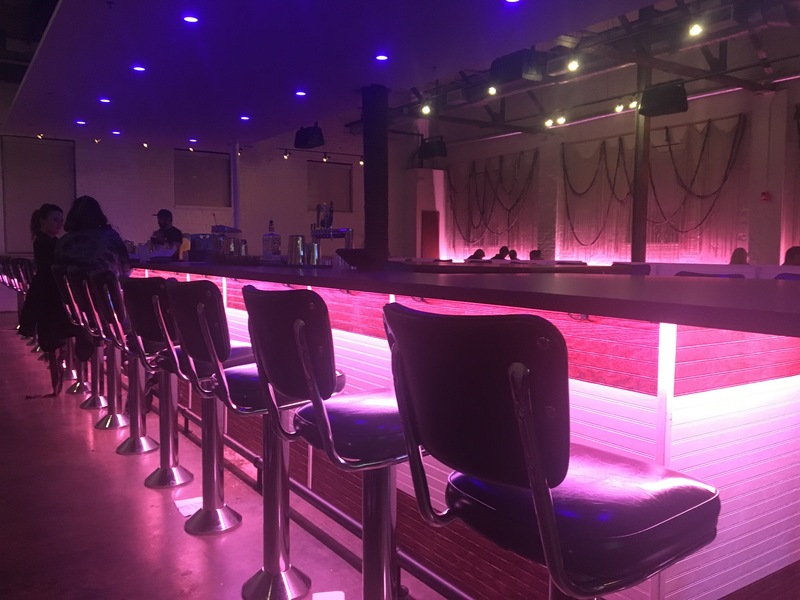 The dim lighting and exposed wires give Deep End the kind of ambience ideal for college students who are eager to explore Atlanta. On Thursdays, Fridays and Saturdays, the stage in the corner of the open restaurant hosts jam bands, DJs and other live music. There were only a couple customers when we dined in on a Sunday evening, but considering the restaurant is just shy of three weeks old, I wasn’t too surprised. Monday through Saturday, Deep End is open until 3 a.m. — the perfect alternative to Steak ’n Shake or Domino’s Pizza for those who need a place to regroup after a night out. While they weren’t the best tacos I’ve ever had, I was content with my meal. While Deep End tries hard to distinguish itself from other hipster bars, its casual, laid back attitude makes me think it’ll probably become exactly that — a place for the cool kids to hang out. [email protected] | Niraj Naik (20B) is from Twinsburg, Ohio majoring in business administration and political science. He is a really nice guy who enjoys spending time with others. If that sounds like you, hit him up!